“You’re going to talk about hair? For two hours?” my mother said after I told her I’d been invited to co-facilitate a Lilith Salon, part of a series of discussions held at hundreds of locales throughout the country, including theaters, synagogues, and private homes. My mother then proceeded to talk about her hair for a good fifteen minutes, and we could have kept going. On a balmy winter’s night, I headed down to the Sixth and I synagogue in Washington, DC for more hair talk with the Not Your Bubbe’s Sisterhood, a group of urban women in their twenties and thirties. I struck up an easy conversation with a redhead with perfectly sculpted curls and big green eyes. She credited a specific “product” for her gorgeous locks and offered a few suggestions about which one might work for my curls. Hair is the ultimate icebreaker for women. We all commiserated about the power and pall of a “bad hair day.” Many heads shook in agreement to tales of the sweet maternal moments of braiding and combing as well as our mothers’ edicts to not cut/grow/straighten/perm our locks. Clearly attitudes about hair and beauty ripple through generations, and one super smart woman articulated the idea that conversations we have about our hair mirror our hormonal, emotional, social, and developmental stages in life. She was spot on. When we talk about hair, we’re talking a whole lot more than gels and bad perms. I was struck by one straight-haired woman’s irritation with people who assumed that because she didn’t have “Jewish hair,” she wasn’t Jewish. As a teen, I desperately wanted to unload my Jewish hair. I’d spent my early childhood in an intense Jewish community, and I found the escape into a secular world alternately terrifying and freeing. I wanted hair that feathered, like Dorothy Hamill or David Cassidy’s or a long blonde mane that swished when I walked. Before bed each night, I showered and braided my wet hair so that my waves would have some predictability when I awoke the next morning. I didn’t wear a cap during swim practice so the chlorine would lighten my hair (it did, to the color of dried mud). I’ve since made friends with my curls, but now I have a host of new hair-related concerns, some pertaining to my role as a mother. I am a liceaphobe, albeit recovering. I cringe when I hear the expression “nitpick,” and I once heard my daughter tell a playmate that they could not share their American Girl Dolls’ brushes. 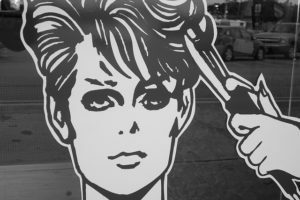 All of the salon women agreed on the overall disgustingness of microscopic eggs feeding on blood drawn from the scalp. Most of the women, however, had yet to experience their first memo from their child’s school nurse and the resulting nuisance of lice combs, endless loads of laundry, and pesticides and/or the embarrassment of their little one being cast as the Typhoid Mary of head bugs (reminiscent of crabs and other communicable issues that circulated through college dorms). I have certain friends with whom I’ve discussed our evolution from a henna, to semi-permanent dye, to permanent dye, to monthly coloring. Others have decided to go gray, and we talk about that too, and for a few hours after we’ve chatted, I swear I’ll stop exposing myself to hair dye toxins (and Diet Coke while I’m at it). My vanity wins out every time. The Not Your Bubbe’s Sisterhood women complained about bushy eyebrows that colonize their foreheads, while my friends submit to using a pencil to fill in the sparseness. We’re saying a slow goodbye to the follicular bounties of our youth, and a tentative hello to the beauty that comes from grace, acceptance, and the growing awareness that life is fragile. When I greet my friend, a breast cancer survivor who has recently completed her chemo, we resume our ongoing conversation about her hair. Soon after her diagnosis, we discussed the inevitability of its loss, the need to shave off the remaining wisps, the day she lost her eyebrows, and her choice to go with scarves and hats versus a wig. When her hair started to grow back we talked about how fantastic she looks with short hair, which she does; every one of our conversations is about her “kicking cancer to the curb” as she says, and returning her hair and her life to the new normal. The sisters of the Not Your Bubbe’s Sisterhood marveled at how the topic of hair can help us bond with the woman who sits next to us on the Metro or serves us a mocha at a cafe or teaches our kids, “who does your hair?” is the only question we need to start a conversation. Hair is also a downy shield. If parted, we reveal the most tender pieces of ourselves.